Lieutenant General Amarjeet Singh Bedi, General Officer Commanding of Gajraj Corps (4 Corps) of Indian Army based at Tezpur paid a courtesy call on Chief Minister Pema Khandu here today. Bedi who replaced Lieutenant General Devraj Anbu as GOC, 4 Corps on November last, appreciated state government’s support to the Indian Army in providing logistical installations, roads and other defence infrastructures, which is coming up positively. He also expressed delight that Army-public relation in the state, particularly in Tawang and West Kameng district is best in the country with homely atmosphere felt, which is not seen elsewhere. To upkeep the friendly relations, the Chief Minister assured full support of the state government to the Indian Army in their welfare works carried out under operation Samaritan urging to continue with such services. 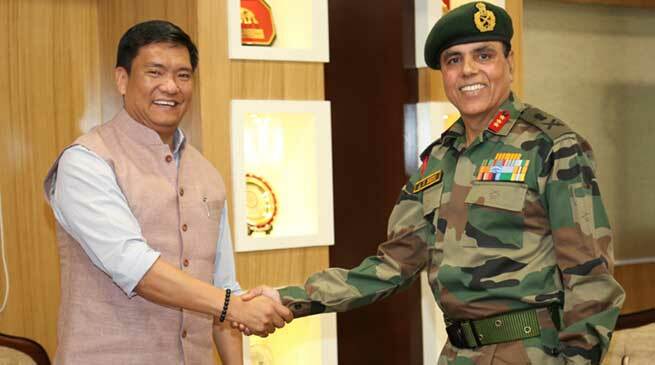 Appreciating the Indian Army’s Maitri Divas observed in forward areas of India-China border, Khandu promised all possible support from state government to the celebration that has helped strengthen the bonds between the two countries. Informed of the low footfall of Arunachali youths in the Indian Army, Khandu urged the Army officials to conduct prior training and coaching programmes for the youths to help them prepare for the exams and physical tests. He observed that unless the youths are given proper guidance, they won’t be able to prepare themselves for the Army recruitment tests. The General assured to organize youth camps prior to recruitment drive with initial physical training and coaching for written exams. The Chief Minister also discussed on erecting a war memorial at Itanagar in memory of martyred Arunachali soldiers. He sought guidance and support of the Indian Army for the war memorial, a proposal that had been pending for long. The General assured support and offered to help erect the memorial with display of old age trophies to attract visitors. Further to improve Army footprint in the state, the meeting discussed on pending task of establishing Army brigade in the state capital for which 500 acres of land has been identified already. The Chief Minister hoped that presence of defence forces will generate not only sense of security but speed up development activities in the area.